Queen Isabella of Spain--No, Not that Isabella, Another One! The daughter of Ferdinand VII of Spain and his fourth wife and queen, Maria Christina of the Two Sicilies, Isabella was born in Madrid and became queen of Spain just before her third birthday when her father died on 29 September 1833. The marriage of Ferdinand VII and Maria Christina is another example (should you need one, at this point) of the tangled history of "traditional" marriage--Maria Christina was Ferdinand's niece, the daughter of Maria Isabella of Spain, Ferdinand's sister. It may be easy enough to look away from Tudor or Habsburg marital decisions--oh, that was in the fifteenth and sixteenth centuries, so long ago!--but certainly by the nineteenth century it's a bit harder to ignore such marriage practices. But marriages between uncles and nieces, like this one, have long been a part of what "traditional" marriage looks like . . . Anyway, the succession of Isabella to the throne of Spain as queen regnant was not undisputed. In the years since the first Queen Isabella had ruled Castile and León (1474-1504), and under the influence of the Bourbon monarchs who began to rule in Spain in the eighteenth century, the Spanish had adopted the so-called Salic law, one that excluded women from inheriting the throne. Ferdinand VII had convinced the Spanish legislature to return to older inheritance laws, allowing his daughter to succeed him. But after the king's death, Carlos, the count of Molina and Ferdinand's younger brother, claimed the title of king for himself and plunged the country into a civil war. In the mean time, Isabella's mother, Queen Maria Christina, was regent of Spain for the young queen. The infante Carlos disputed the legality of his brother's revocation of the Salic law of succession; his "Carlist" supporters claimed that Maria Christina had in fact forged her husband's signature on the documents naming his daughter as his successor and/or that Ferdinand had really named his brother as his successor but that Maria Christina had somehow concealed his true plans. The Queen-Regent maintained her daughter's position throughout the civil wars over the succession, and those loyal to Isabella defeated the Carlists in 1839. But Maria Christina's own secret marriage caused her ouster in 1840--she was exiled from Spain, leaving Isabella behind in the hands of a new regent, General Baldomero Espartero, prince of Vergara. On 8 November 1483, Espartero's opponents declared the thirteen-year-old legally of age, and although the new queen reigned, she did not rule. Among the many reasons for her inability, Isabella's complete lack of education must certainly have contributed to her problems. The couple was unsuited, the marriage was unhappy, and those darned Carlists, still unhappy and unsatisfied, claimed that Queen Isabella's children, including Alfonso, her heir apparent, were not the king's children. 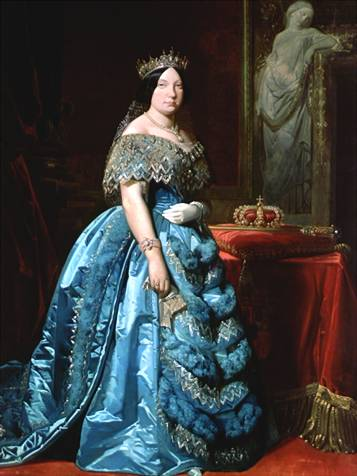 Although Isabella II remained on the throne, she never exerted power, and on 30 September 1868, she was forced out of Spain and went into exile in France. In the end, she "abdicated" on 25 June 1870 in favor of her son, who became Alfonso XII. She did visit Spain during her son's reign, but she never again lived there. She died in Paris on 10 April 1904. There isn't a very current biography of Isabella II in English, but you can buy used copies of Peter de Polnay's 1962 A Queen of Spain: Isabella II or Ottilie Boetzkes's 1966 The Little Queen: Isabella II of Spain. If you can read Spanish, you may be interested in Silvia Miquens's 2007 Isabel II, la Reina de los Tristes Destinos or Isabel Maura Burdiel Bueno's Isabel II, o el Laberinto del poder (2010), which you can download in a very affordable Kindle edition.